X-rays are produced in some of the most energetic processes in the Universe, but because they are blocked by Earth's atmosphere, they can only be observed from space. When X-ray telescopes observe the extragalactic Universe, they basically see two sources: the hot gas pervading clusters of galaxies, and Active Galactic Nuclei (AGN) – bright, compact regions at the centres of some galaxies where a supermassive black hole is accreting the surrounding matter. ESA's XMM-Newton is one of the most powerful X-ray telescopes ever placed in orbit. 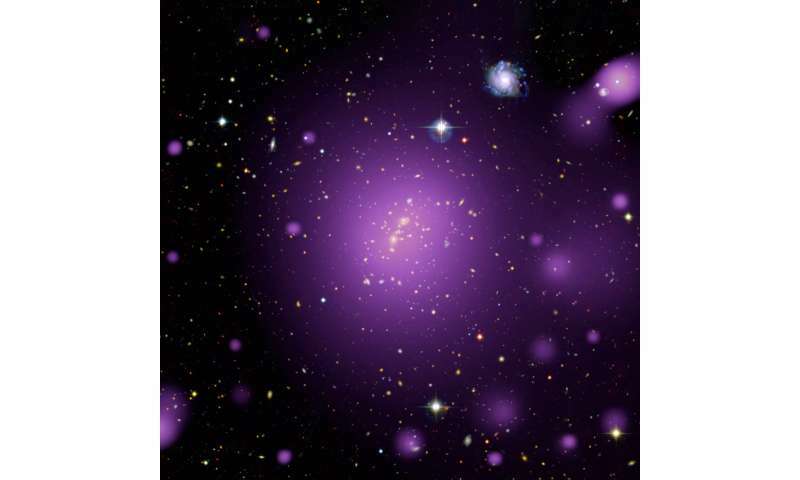 Over the last eight years, it has spent 2000 hours measuring X-ray radiation as part of the XXL Survey, which searched for galaxy clusters and AGN by scanning two areas of seemingly-empty sky each measuring 25 square degrees (as a reference, the full moon measures about half a degree across). The first set of XXL data was released in 2015; it included 100 of the brightest galaxy clusters and 1000 AGN. 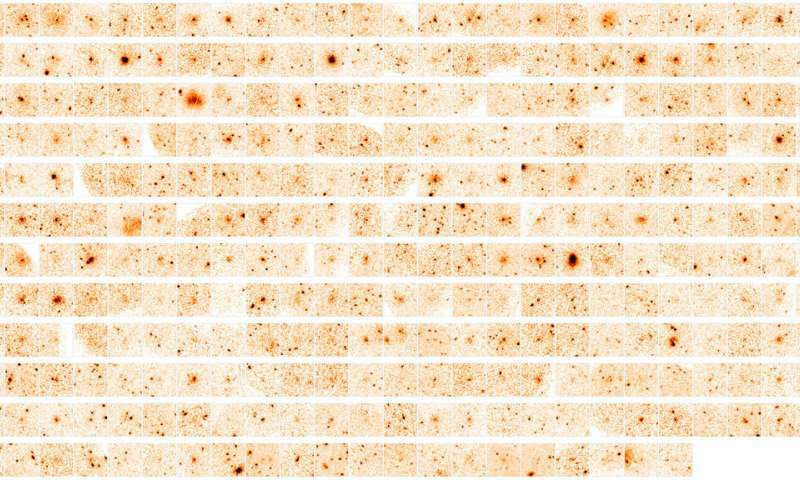 This month, a new data catalogue was published containing an astonishing 365 clusters and 26 000 AGN. The first results using this data are published in a special issue of Astronomy & Astrophysics. 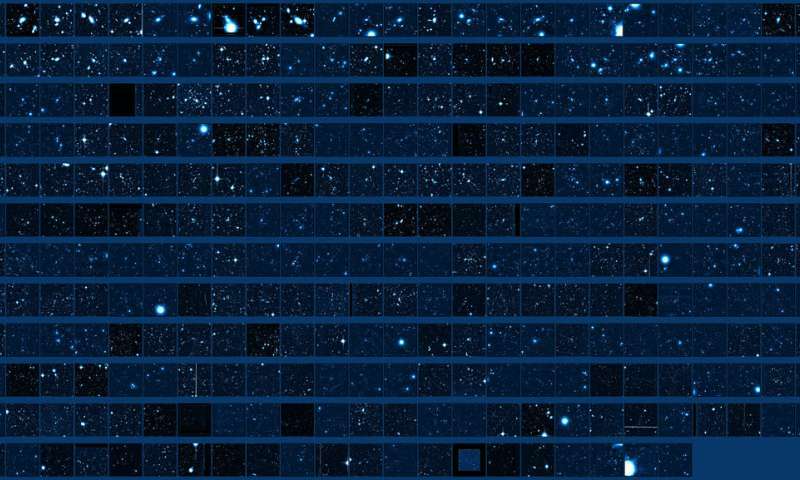 The survey mapped X-ray clusters so distant that the light left them when the Universe was just half of its present age, and AGN that are even further away. Some of the observed sources are so far-flung that XMM-Newton received no more than 50 X-ray photons from them, making it challenging to tell whether they are clusters or AGN. "It was relatively easy to find galaxy clusters and AGN, because they are the only extragalactic objects visible in X-ray light," explains Marguerite Pierre from CEA Saclay, France. "But we had to use several other telescopes collecting light at many different wavelengths, as well as extensive computing facilities, to gather more information about each source, including pinning down their nature and distance." Matter in the Universe is not evenly distributed but forms a cosmic web of filaments shaped by gravity, with galaxy clusters found at their intersections. Galaxy clusters are the largest bound entities in the Universe – they trace the highest density peaks in its large-scale structure, making them a powerful tool for answering questions about cosmology. The structure and evolution of the Universe is described by a set of cosmological parameters, which include the density of its various components and the rate that it is expanding. Currently, we know the value of many of these parameters fairly well, but large samples of cosmic tracers at a variety of distances are required to more accurately describe the underlying structure of the Universe. The ultimate goal of the XXL Survey is to provide an extensive, well-characterised catalogue of clusters that can be used to constrain the cosmological parameters. ESA's Planck satellite determined values for cosmological parameters by studying the cosmic microwave background, which is information from the very early Universe. After estimating these parameters using the latest data from the XXL Survey – which is based on information from the more recent Universe – scientists compared their findings against the Planck values. "Although we didn't find as many galaxy clusters as predicted by the Planck cosmological model, we obtained a distribution of clusters and AGN that is compatible with the currently favoured cosmological model, which resorts to Einstein's cosmological constant as an explanation for the accelerated expansion of the Universe, rather than invoking even more exotic possibilities," explains Marguerite Pierre. "We can already improve on the Planck estimate for the cosmological constant, even though our analysis has only been carried out on half of the XXL cluster sample; we will spend the next couple of years analysing the rest of the data with the aim of refining the cosmological constraints." It is more difficult to estimate values for the cosmological parameters using AGN, as their properties are affected by many external influences. Scientists have instead been using the AGN data from the XXL Survey to understand more about how black holes form and evolve. Thanks to XXL, this is the first time that scientists have been able to measure the three-dimensional clustering effect of distant X-ray clusters and AGN on very large scales. They can now finally see where the AGN are located within the large-scale structure of the Universe indicated by the galaxy clusters. The results confirm that XMM-Newton is a powerful survey machine. They also pave the way for the final cosmological analysis of this survey, which will provide independent constraints on the cosmological parameters to unravel more mysteries of the Universe. The cosmic web will be probed further by ESA's future Euclid satellite, which will observe light emitted up to 10 billion years ago. Euclid will see a huge number of sources, as it will detect optical and infrared light; with its large surveyed area and rich multi-wavelength coverage, the XXL data will serve as a reference for these observations. Observations by XMM-Newton have also raised new questions about the physics of galaxy clusters, which will be investigated in greater detail by ESA's next X-ray mission, Athena. Due to launch in 2031, Athena will be far more sensitive than its predecessor. While XMM-Newton can observe clusters at a variety of distances from us, probing different epochs in the Universe's history, Athena will observe clusters so distant that their light left them as they were forming, telling us even more about the way these gigantic structures take shape and evolve. In the meantime, scientists in the XXL collaboration plan to process the remaining observations and review data using improved processing techniques. The final XXL data release containing even more X-ray sources, as well as the complete cosmological analysis, is foreseen for 2021. "It is very exciting that data from this space telescope is contributing to our understanding of the evolution of the Universe," concludes Norbert Schartel, XMM-Newton Project Scientist at ESA. "This was made possible thanks to the collaboration between a huge number of institutions across many different countries." So the completely new and independent dataset agree with the Planck LCDM model at 0.5 sigma! It also cut the uncertainty in the vacuum energy (i.e. cosmological constant being constant) with 30 %. "This was made possible thanks to the collaboration between a huge number of institutions across many different countries." So, a huge number of institutions are mislead to still believe on the epicycles of standard cosmological model, such as Dark Energy/Matter densities in accelerated (vs. decelerated) expansion. The major flaw of GR and QM theories about constancy of the TRUE (vs. locally observable reduced) value C and ticking rate of atomic clocks was corrected since 1995 break-throughs of Suntola Dynamic Universe - together with 5-10 other mistaken GR/QM postulates. Today's deceleration rate is -35.5 km/s/Mpc or Hubble constant 71 km/s per 1 Mpc optical distance. This deceleration d/dt (dC/C) 'strain' -1.15 10^-21/ms of reduced atomic ticking rate fooled the GW 'proofs'.